The author’s developed the following tables as a crew planning tool. 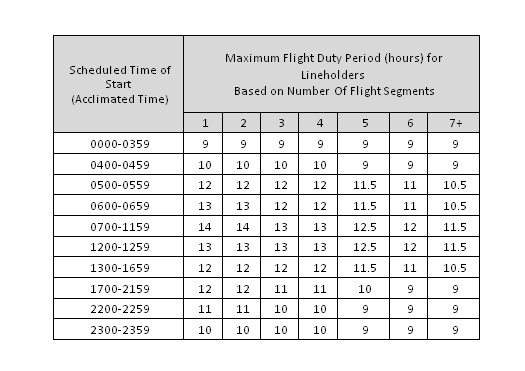 These tables demonstrate how strict FAR Part 117 work rules are in relation to allowed duty time when compared to FAR part 121 subpart Q for Flightcrew activated from Short-Call Reserve. 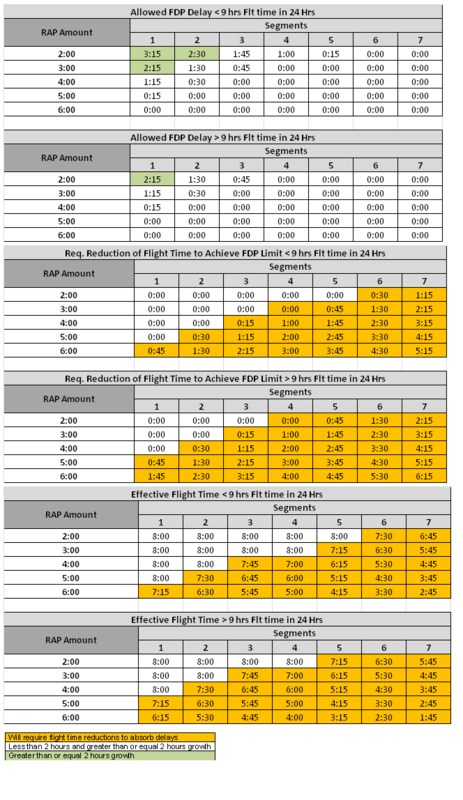 In order to schedule efficient pairings the Airlines should consider looking at productive hours (block time) versus non-productive hours (FDP time). The amount of time used to schedule a FCM within the permissible limitations of FAR part 117.11, for the purposes of this paper we will use 0:30. The minimum time from when an aircraft arrives at the gate, to the time when the aircraft moves away from the gate to allow for sufficient to unload/load passengers and baggage, and make any required service needs for the aircraft before departure as well as performance of pre-flight checklists, for the purposes of this paper we will use 0:45. Under FAR 117.19, it is permissible to operate beyond the scheduled limitations in FAR 117.13 by 0:30, extensions up 2:00 may be conducted before departure under certain conditions, for the purposes of this paper we will use 0:30. 1 Under 117.23, FCM’s are limited to 100 hours in 672 consecutive hours and 1000 hours in 365 calendar days. 2 Under 121 subpart Q, FCM’s are limited to 30 hours in 7 calendar days, 100 hours in a calendar months and 1000 hours in a calendar year. 1 Under 117.23, FCM’s are limited to 60 hours in 168 consecutive hours and 190 hours in 672 consecutive hours. 2 Under 121 subpart Q, FCM’s are presently not limited by FDP time. A required rest period in the 24 hours preceding the actual expected completion of a flight segment. The may be reduced due to operational contingencies before takeoff. Reserve has consistently interpreted by the FAA as not rest. Under FAR 117, the FCM must be scheduled to end the FDP under the more restrictive of the RAP / FDP Limit, or Scheduled FDP limit. In the depiction above, the FDP must end by 18:00. Extensions under 117.19 must be applied once the FDP is delayed and is expected to end after 18:00. Unlike Airport Standby, where a FCM is actually on FDP, Short Call FCM’s are not at the Airport. Unlike Long Call Reserve, a FCM is expected to report for the FDP without an intervening rest period. Since the FCM may need to travel to the location where the FDP will start most airlines will have a minimum amount of time to allow for the ‘call out’. Starting with the Basic Scheduled Limitations. Applied to the duration of the RAP, the Combined RAP + FDP limits are derived. This yields the Max Scheduled FDP assigned During the RAP. Under both FAR 117 and FAR 121 subpart Q, the Allowed FDP Delay diminishes with an increased amount of time from the start of the RAP to the Report of the FDP. The same can also be said concerning the Allowed FDP Delay with respect to an increase in the number of scheduled flight segments. FAR 117 also has a Diurnal component, with the highest Allowed FDP Delay values for FDP starts 07:00 and 12:59. Average Flight Time per segment, predictably diminished with an increase in the number of flight segments, the same can also be said for increased amount of time from the start of the RAP to the Report of the FDP. Given these facts, it seems that it would impractical to apply RAP FDP to FDP’s with more than 4 segments. With respect to efficiency, FAR 117 exhibited better efficiency than FAR 121 subpart Q for a short amount of time from the start of the RAP to the Report of the FDP equal to 2:00, 81.85 percent to 79.56, however, with increasing amount of time from the start of the RAP to the Report of the FDP above 2:00, FAR 121 subpart Q out performed FAR 117. 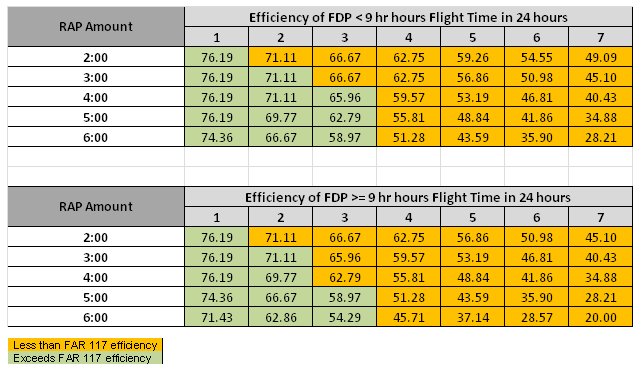 We did examine the application of 2:00 extensions, and FAR 117, performed better in efficiency, Average Flight Time per Segment, and Allowed FDP Delay. FAR 117 Short-Call Reserve is best applied within the first 3 hours of the RAP, and is best applied to FDP’s with less than 5 flight segments. When Short Call Reserve is applied after 3 to 6 hours of the RAP, less than 3 or 4 flight segments seems to be the most practical. With 7 hours up to 9 hours, very limited situations will allow for its use, however it is still feasible. Beyond 9 hours, seems that it is not very practical, a FCM may be released into a Rest Period and then assigned directly to a FDP.